Staying an area means to stabilize it so that it doesn’t stretch out. 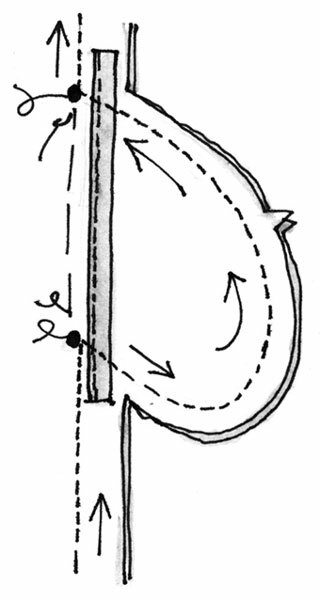 For example, staystitching prevents a curved edge from stretching out of shape while you’re working on the project. To stay the pocket, you use a strip of twill tape. Cut a piece of twill tape 2 inches longer than the length of the pocket opening. Place the tape on the wrong side of the front pocket seamline, centering it next to the marks for the pocket opening. Stitch it to the front pocket fabric only. This is a pocket stay and makes the pocket opening “stay” in shape, even when you hang your hands in your pockets for hours at a time. When you press open the clipped seam allowance, the pocket falls toward the front of the garment. Why is this a good thing? When the garment is worn, the pocket is pushed toward the front of the garment. By clipping the seam allowance, the side seam isn’t pulled out of whack.